FILE PHOTO: Israeli soldiers take part in an exercise in the Israeli-occupied Golan Heights, near the ceasefire line between Israel and Syria, March 20, 2017. JERUSALEM/BEIRUT - Five projectiles from Syria set off air raid sirens in Israeli towns on Saturday, prompting the Israeli military to say it would step up its response to stray fire from the Syrian war that has repeatedly spilled over the border. The projectiles crossed into the Israeli-occupied Golan Heights and the military said it targeted three Syrian artillery guns in response. No damage or injuries were reported in Israel. The Syrian military said it came under attack in Quneitra province, which sits near the Golan Heights territory that Israel captured from Syria in the 1967 Middle East War. “The Israeli enemy assaulted one of our military positions this morning, which led to material damages,” it said. During Syria’s more than six-year-old conflict, Israel has returned fire across the border, including stray shells from fighting among Syrian combatants. The Israeli military statement suggested it may start escalating such retaliations. “Whether errant fire or not, any future occurrences will force the Israel Defense Forces to intensify its response,” it said. Israel “holds the Syrian regime responsible and won’t tolerate any attempt to breach Israeli sovereignty,” it added. Syria’s foreign ministry warned of “the grave consequences of such repeated aggressive acts” which it called a flagrant violation in a letter to the United Nations, state media said. The Syrian military said it held Israel responsible. Israel has also carried out targeted air strikes in Syria during the war, alarmed by the expanding influence of Iran, the Syrian government’s ally. The Israeli air force says it has struck arms convoys of the Syrian military and Lebanon’s Iran-backed Hezbollah nearly 100 times in recent years. Iran’s military chief warned Israel against breaching Syria’s airspace and territory on a visit to Damascus this week. The general signed an agreement with his Syrian counterpart to further boost military cooperation, Iranian state news agency IRNA said on Saturday. Rebel factions fighting the Damascus government in the multi-sided war hold swathes of Quneitra, while the army and allied militias control another part of the province. Both warring Syrian sides accused each other of prompting the Israeli attack on Saturday. 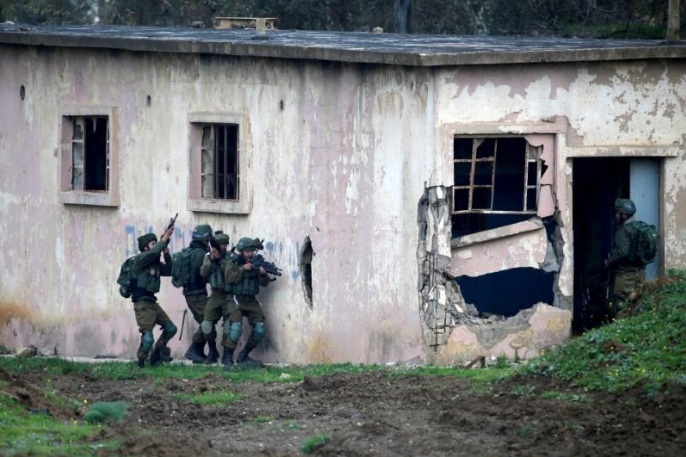 The army said militants in nearby territory fired mortar rounds into the Golan Heights. A rebel official in Quneitra said pro-government fighters had been shelling insurgent-held parts of the province, when some of the shells fell on the Golan Heights. Five projectiles from Syria set off air raid sirens in Israeli towns on Saturday, prompting the Israeli military to say it would step up its response to stray fire from the Syrian war that has repeatedly spilled over the border.